It all started with former President Barack Obama and Michelle Obama, who wanted to give back to a community that gave them so much. They wanted to create an engaging and welcoming place that would inspire people globally to show up for the most important office in any democracy — that of a citizen. 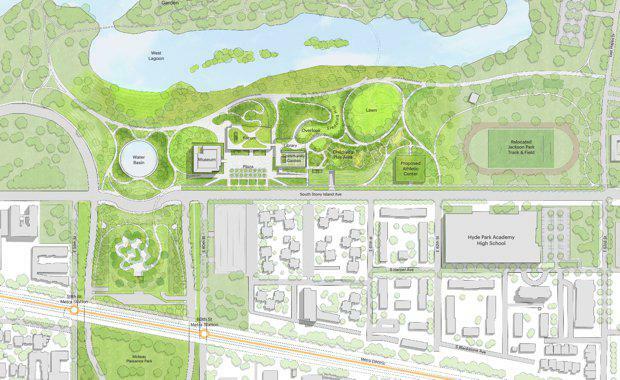 At a community event, the Obama Foundation released the conceptual vision and site map for the Obama Presidential Center. More than a building or museum, the Obama Presidential Center will be a living, working centre for engagement — an ongoing project for the community and world to shape what it means to be an active citizen in the 21st century. The center will include a state of the art museum, classrooms, labs, and outdoor spaces, and it will conduct programs that will give visitors not just memories, but real tools to create change in their own communities. It will be based on the South Side of Chicago but, via partnerships, programs, and digital initiatives, have projects all over the city, the country, and the world. “The Obamas want to create a safe, warm, inviting place that brings people in, teaches them something new, and inspires them to create change in their own communities," Obama Foundation Chair Marty Nesbitt said. "The center will be a place for doing, not just looking or listening. 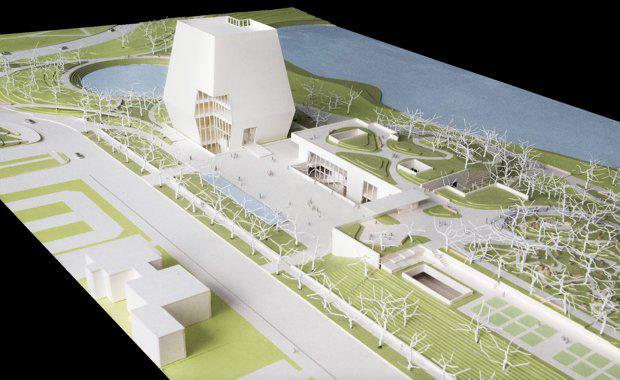 The center will be integrated into Jackson Park, a historic park in the heart of the South Side of Chicago, the community the Obamas call home. The center will strengthen the economic climate of the community by bringing hundreds of thousands of visitors to the South Side every year, creating new jobs and opportunities on the South Side, and revitalising historic Jackson Park. The design concept released today envisions three buildings – the Museum, Forum, and Library – forming a campus surrounding a public plaza. Honouring the legacy of Frederick Law Olmsted and Calvert Vaux, the center is designed as a campus in historic Jackson Park to help unlock the full potential of the park as a recreational destination and center for gathering on the South Side for families, community members and visitors alike and to re-establish the South Side’s connection to the Lagoon and Lake Michigan. The campus will be open to the public and the center will include indoor and outdoor spaces to gather, learn, create and collaborate. The Forum will contain Foundation offices, an auditorium, restaurant, and public garden. The Forum and Library will be single story structures with planted roof terraces. The buildings will be connected below grade and clad in a lively, warm and variegated stone while glass openings are deliberately placed to form courtyards, mark entries, frame views, and bring in natural light. 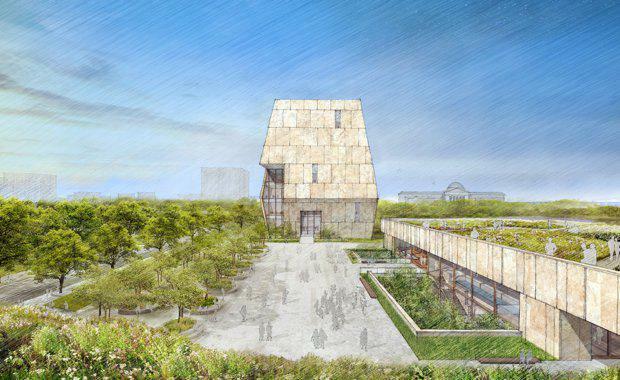 The center will be a real-life symbol of The President and Mrs. Obama’s commitment to sustainability. 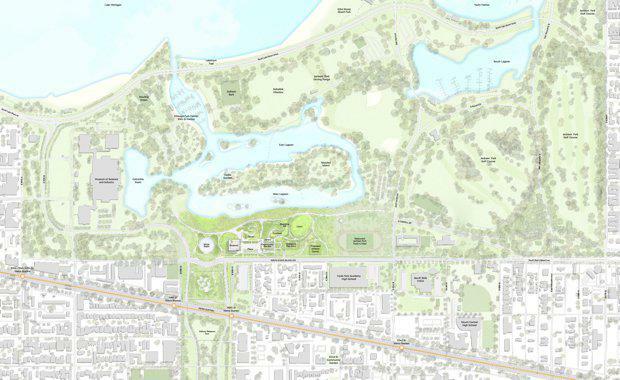 The total size of the center will range between 200,000 - 225,000 gross square feet, but the concept site plan imagines a re-shaping of the Park that will result in a total net increase in green space for Jackson Park. Obama Foundation CEO David Simas said the Obamas charged the Foundation with developing an engaging and welcoming centre that will inspire people globally to ‘show up’ for the most important office: citizen. "The center is designed as a campus to integrate into historic Jackson Park and to encourage local residents and visitors alike to explore the community and bring people together for events, recreation, and programming. "We are pleased to be working with community leaders, local institutions including the Museum of Science and Industry and DuSable Museum, the University of Chicago, and City of Chicago on the vision for the center and Jackson Park, and look forward to receiving feedback from the community in the coming weeks and months," he said. The design team for the OPC is led by Tod Williams Billie Tsien Architects | Partners (TWBTA)and Interactive Design Architects. The landscape design team is comprised of Michael Van Valkenburgh Associates, Site Design Group, and Living Habitats. Ralph Appelbaum Associates will lead the exhibition design team for the OPC, in partnership with Civic Projects and Normal, and artists and educators Amanda Williams, Andres Hernandez, and Norman Teague. The center Consortium, a tri-venture comprised of Jones Lang LaSalle, McKissack & McKissack and Ardmore Associates, is leading the project management of the design and construction of the OPC. To ensure that the work of the Foundation is informed by a diverse set of viewpoints and is in line with its values of diversity and inclusion, the Obama Foundation announced the formation of an Inclusion Council in October 2016. “The design approach for the center is guided by the goal of creating a true community asset that seeks to inspire and empower the public to take on the greatest challenges of our time," Architect Tod Williams said. 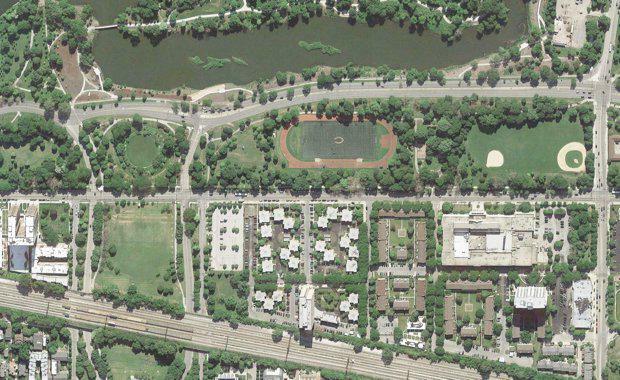 "The Obamas were clear that they wanted the center to seamlessly integrate into the Park and the community, and include diverse public spaces.